Crunchy, cream-cheesy bites of sweetness! Things that go together: doughnuts and coffee, sugar and spice, cheese and crackers, me and anything chocolate, and…cooking and drag queens?!??? Apparently so! The other day I came across a funny youtube video when I was surfing the net for cooking videos. The title of the series is “Cooking with Drag Queens“, and it is, literally, a cooking show where the hosts cook with drag queens. In full drag. The dishes seem nice if not polished to a T, but the drag queens are definitely polished and then some! (I wish my hair was half as good). The show isn’t everyone’s cup of tea, but I did find it fun, and liked the documentary parts of each episode the best. And then of course I had to try one of the recipes! Which recipe? Quesitos! Because they sound like a version of the Venezeulan cachitos that the DH introduced me to (my waistline will never be the same). 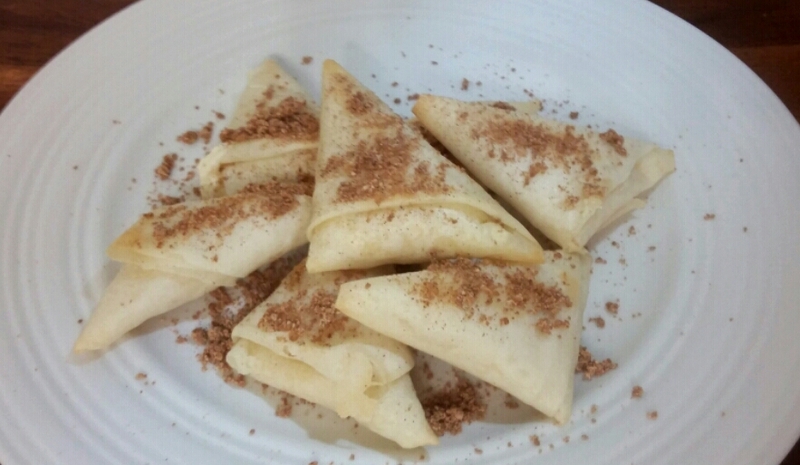 Quesitos are a pastry filled with sweetened cream cheese; very easy to nom upon. Cachitos are sort of like mozzarella sticks covered in dough and fried, but much tastier than that description. Personally, I wonder if there are many versions of cachitos/quesitos/cheese-filled pastries-savory-sweet-or-otherwise floating around Latin America. Whether or not there’s any relationship between the two cheese pastries, I decided to try the recipe shown in the youtube video, but with a classic me twist (substitutions, oh YEAH!). 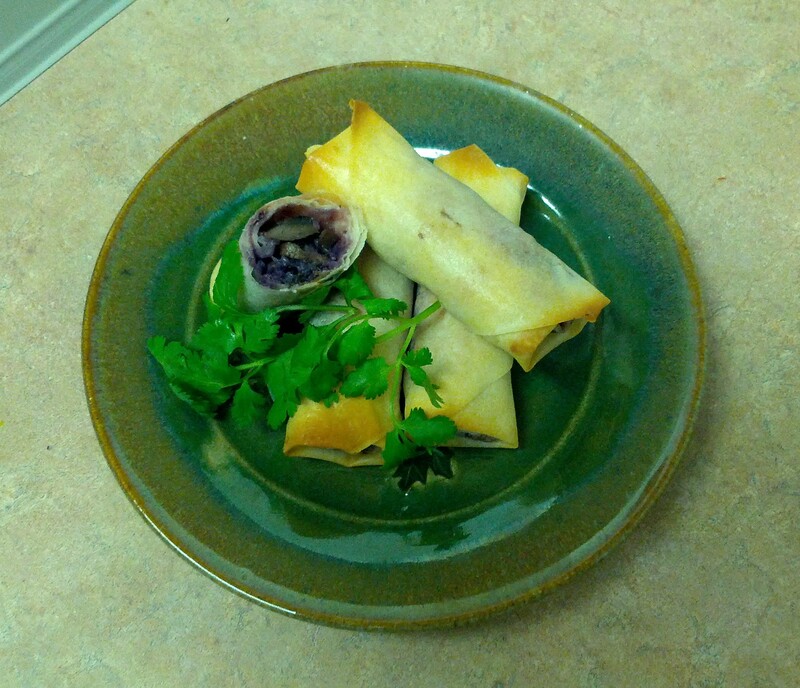 Instead of the filo dough that the hosts suggested, I used spring roll wrappers that I had sitting in my freezer. And instead of the brown sugar that they suggested to sprinkle on top, I ground up some of the cane sugar block that I had in my kitchen cupboard (courtesy of a shopping trip by the DH to a South American store). The results? I loooooved that filling! So yum! The spring roll wrapper pastry I wasn’t super thrilled about, and the filo pastry, eh, I’m just not feeling it. I’m not sure what the best wrapper would be. Any suggestions, my cooking confreres? Let me know in the comments! Next Post: Buns, buns, bunnnnnnssssss…aka Dinner Roll Odyssey. I’m pretty sure. Or maybe chocolate cake. This entry was posted in Breakfast Foods, Snacks on May 19, 2016 by Margaret. Patience is a virtue, and this cake is only too happy to teach it to you. When it comes to me and my kitchen time, the DH and I have different views. I alternate between throw-it-all-together (pretty much my standard approach) and getting into the slow-food zen of multi-part recipes that take multi parts of my days. This week’s bake-a-long recipe was a zen sort of experience. My bake-a-long group is making Dorie Greenspan’s Tarte Tropezienne from her Baking Chez Moi cookbook. I hadn’t read the recipe beforehand, just skimmed the ingredient list to make sure I had everything in stock, so it was a bit of a shock to realize that I had to make the dough, let the dough rise, chill the dough, let the dough rise again, roll it out, possibly let it rise again (frankly, I had tuned out after the first rising, so I’m not even sure if this final rising was actually even outlined in the recipe), before even baking the brioche style cake. 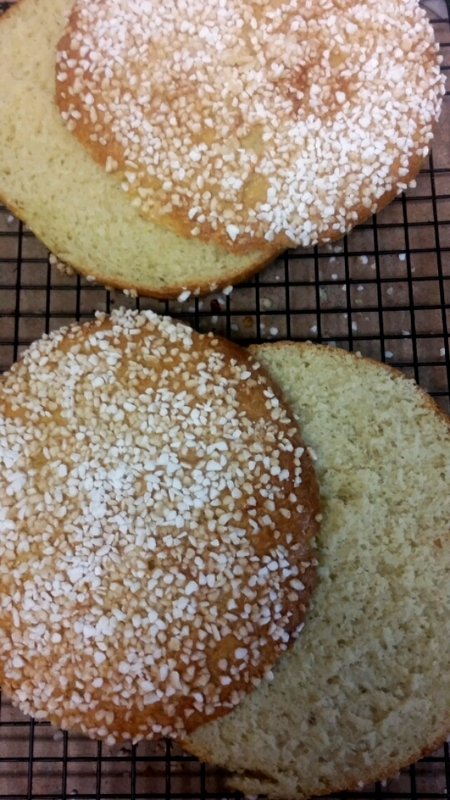 Sugar-crusted brioche layers, awkwardly photographed, because no patience. And after all the rising and the chilling and the losing track of which rising and flattening I was on, then came making the pastry cream. And letting that chill. 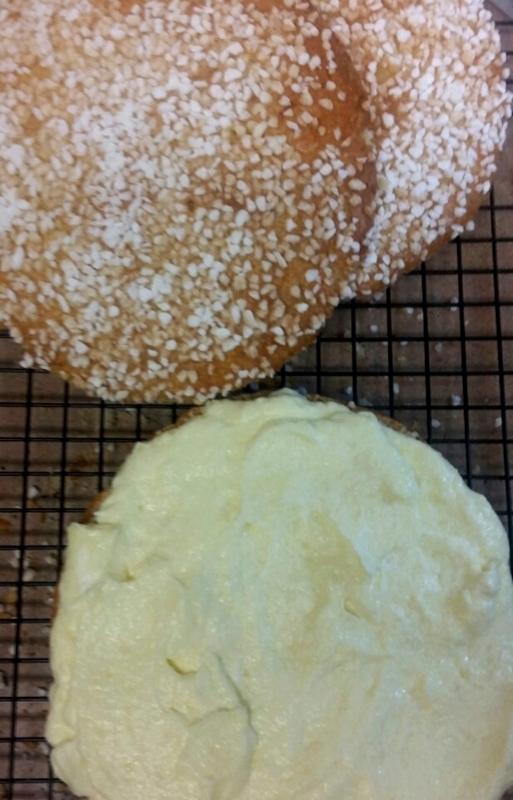 And then folding in the whipping cream, spreading it inside the (chilled) cake, and then letting that chill. Frankly, it was either scream or…chill. Guess which one I went with? That’s right, I took a deep breath and chilled out. As much as I love eating the product of my labour (and in fact it is most of the reason I labour at all), I also can appreciate the meditative aspect of a multi-part recipe. Even if I begrudge the waiting for the eating. The DH, on the other hand, once he accepted that I was baking and he would be *cough* forced *cough* to eat it, he couldn’t wait and hovered over me while I put the cake together. I gave up on the final chilling, and just photographed it and we ate half of one of the two mini tartes that I had made. Then I chilled the rest. Am now lying on the sofa and…wait for it…chilling, while I write up my post. Looking light, but full of eggs and butter. Alternative caption: Awkward cake is deliciously awkward. Next Post: Dinner Roll Odyssey! Or something else. Maybe mini mint chocolate cupcakes? Mmm…. This entry was posted in Cakes, Cook-a-Longs R Us on May 12, 2016 by Margaret. Healthy spring rolls! A tad purple, but hey, I can live with that. Time for another Memories of Meals Past post! This time it’s a lunch/light dinner food, spring rolls, that I made a few months ago. But made healthier by baking as opposed to deep-frying! I used this recipe as a starting point, and then naturally I made substitutions. I had half a head of purple cabbage in my fridge, so I grated that and added that into the filling, along with some dried mushrooms (albeit not the shiitake kind that the recipe called for). Pro Tip: Do not use purple cabbage if you want a perfect presentation. Purple cabbage makes everything purple. Your filling, your wrappers, your fingertips. But it is healthy, so if you have it in your fridge, well…waste not, want not! And these spring rolls were delicious! The DH and I happily crunched on them for dinner and lunches. I do love trying new recipes and…substituting ingredients! 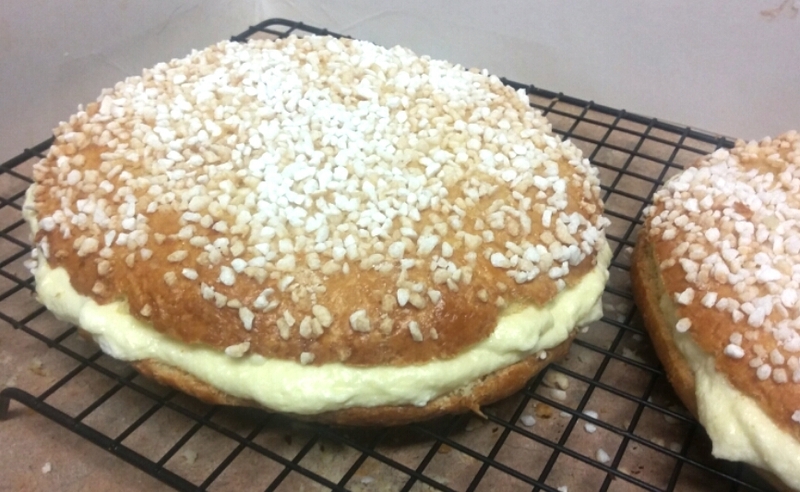 Next Post: I go French with Tarte Tropezienne! This entry was posted in Memories of Meals Past, Vegetarian Main Dishes, Vegetarian Side Dishes, Waste Not Want Not on May 9, 2016 by Margaret. When I was a grad student, I was always trying to stretch my pennies, and that including trying to stretch my food budget. I even wrote an article about stretching one’s food budget for my university paper; I talked about using root vegetables and seasonal produce. I came across a cookbook in a local store around the same time, and it was all about potatoes. Perfect timing, and perfect for my budget! One of the recipes in it was a seasoned potato wedge dish. I’ve made variations of this dish for the DH and I over the years, and they’re always delicious. Plus healthier for you than deep-fried potatoes! Want to make some yourself? Here’s how! Cut your potatoes into 6-8 wedges each. 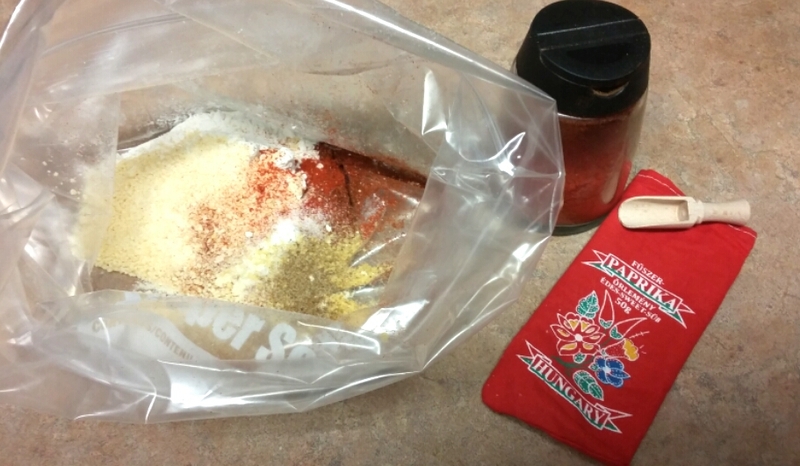 Mix up remaining ingredients in a large plastic baggie (a large freezer bag is a good size). Add in potato wedges and shake until coated, being careful not to overshake. * Empty bag onto oiled baking tray. Bake in 350 degree oven for 45 min or a bit longer depending on the size of the wedges. *Or, have a dance party. Why? Well, why the heck not? One never needs a reason to shake, shake, shake! Made with authentic Hungarian paprika! 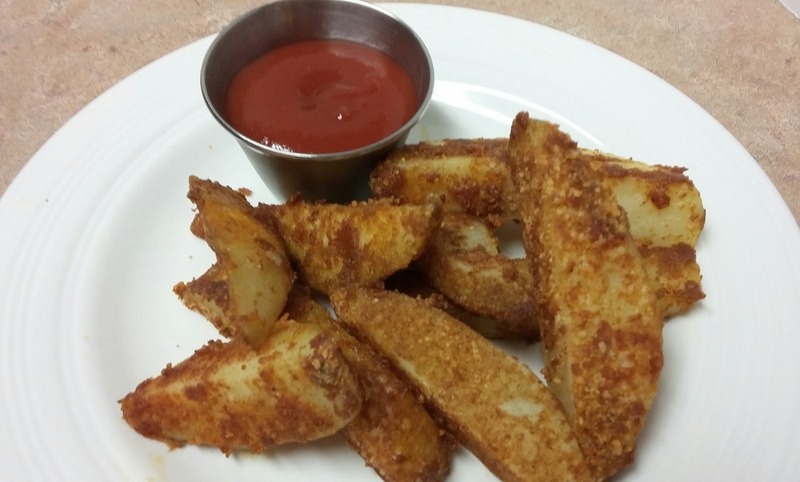 Serve and enjoy your seasoned potato wedges! Inexpensive, and pretty darn tasty! Next Post: That Dinner Roll Odyssey I’ve been talking about? Or perhaps a Memories of Meals Past? Albeit on a Friday/Saturday/Whenever? This entry was posted in Vegetarian Side Dishes on May 6, 2016 by Margaret.